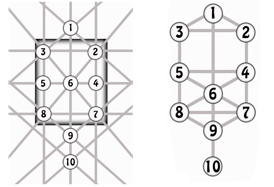 The Tree of Life is divided into three columns containing ten Sefirot. They are numbered from top to bottom, right to left as you look at the chart. Each Sefirah (singular) represents a different attribute of God in mankind. Many scholarly kabbalists see the Tree of Life only as a symbol to illustrate these Divine attributes. They see Kabbalah as a way to understand spiritual concepts intellectually. Practicing kabbalists, however, who use kabbalistic techniques to enter ecstatic states of consciousness, see Kabbalah as a body of teaching to help humans draw closer to the Creator. To these kabbalists, the Tree of Life is a real pattern of energies or lights put into place by the Creator. Some kabbalistic masters have reported seeing the Tree of Life in a pattern of lights while in ecstatic states of mind. I know it is a bold statement to say that I have found the Tree of Life with dowsing. I feel, however, with all my being that this is the Tree of Life, and I can teach just about anyone to find it and work with it. I have taught six rabbis to dowse and all were able to find the Tree of Life, even though only two of them knew what I was guiding them to find. I am now working with noted authors and teachers of Kabbalah. I can give them a tangible way to explore and work with the Tree of Life and they can help me understand more about what I am finding. Although Kabbalah has been adapted into other spiritual traditions, including Christianity and many “mystery schools”, I feel it important to begin my study of Kabbalah where it began, in Judaism. I now know that the entire Tree of Life pattern is around everyone’s bed. I only found parts of it before because I was dowsing for beneficial energies (lights) that were part of the Bed Pattern. For some reason, I thought the Bed Patter was only beneficial. Now I know that one or more of the pairs of lights can be out of balance and would dowse as detrimental. If one light dowses as detrimental or unbalanced, it’s mate will too. A properly stated, sincere prayer transforms the detrimental lights to be beneficial, and it can help the person to heal. When more of the complete bed pattern seemed to “appear” after prayer, it was simply that detrimental or unbalanced lights had changed to be beneficial, bringing them into balance. The Tree of Life pattern doesn’t actually come to beds; the pattern is around us and we imprint it around our beds. It is actually part of us. When you change the energy pattern around your bed, you are actually changing your own Human Energy Pattern. Of course, if you don’t change the things in your life that created the “detrimental” elements of your pattern in the first place, they will return to the unbalanced state. Or click on any of the buttons to the left or top to navigate through the site.